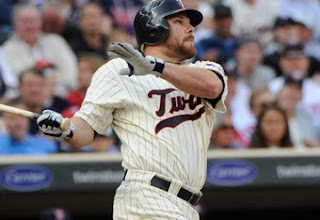 Jim Thome has hit 57 career home runs against the Twins, but he started the healing after taking LA Angels pitcher Brian Stokes deep in his ninth at-bat as a Twin. Thome, who now has 565 career home runs, is only eight shy of tying Twins great Harmon Killebrew for 10th on the all-time list. It was Thome's first home run off Stokes, and has now taken 370 different pitchers deep. Most of Thome's home runs have come off of Rick Reed (9), Roger Clemens (8), and Justin Verlander (7). With their most feared line-up in years, the Twins have all the tools to put up over 1,000 runs on the board. But in order to do that, they need to get more production from the top of the lineup. Denard Span was 0-5 with three strikeouts in on Opening Day, and it hasn't gotten much better. Span is batting .161 (5-31), with only one extra base hit. Newly acquired second baseman Orlando Hudson isn't fairing much better from the two hole. Hudson, a career .282 hitter in nine MLB seasons, is hitting .229. After going 1-3 on Opening Day, Hudson is hitting .218 (7-32). Hudson's reputation was tarnished early in the season in Chicago. With the bases loaded and one out in the first inning, Hudson took off on the pitch, which was caught by Alex Rios. With Hudson forgetting there was only one out, Rios threw to Gordon Beckham, forcing Hudson at second and ending a potentially big inning for the Twins. 7. Nine homers in four games?!? Yes, you read that right. The Minnesota Twins set a franchise record by hitting nine home runs in their first four contests: Delmon Young, Justin Morneau, and JJ Hardy each had two and Joe Mauer, Jim Thome, and Brendan Harris each had one. The Twins bullpen has been absolutely lights out in the first week of the season. Pat Neshek, Jon Rauch, Joe Mijiares, Brian Duensing, Matt Guerrier, Jesse Crain, and Alex Burnett have a combined 1.66 ERA with 14 strike outs in 22 innings pitched. The only runs allowed have been by Rauch (one), Duensing (one), and Mijares (two). After losing All-Star closer Joe Nathan for the season following Tommy John surgery, a big hole opened up at the end of the Twins bullpen. There were a variety of names thrown around to fill his spot: Pat Neshek (missed 2009 following Tommy John surgery), Matt Guerrier (5-1, 2.86 ERA in 2009), Jesse Crain (7-4, 4.80 ERA in 2009) or Francisco Liriano (5-13, 5.80 ERA as a starter). Twins coaches weren't sure how Neshek would hold up following his surgery, Guerrier has been a great set up man for the Twins, leading the league in relief appearances in both 2008 and 2009, Crain's ERA was upwards of 7.00 from April to September last season, and Liriano made the rotation as the fifth starter. This opened the door for Jon Rauch. Rauch, who has appeared in 275 games the last three seasons, stands at 6'11" (Rauch is the tallest player ever to hit a home runs, taking Roger Clemens deep in 2007) and is covered in tattoos. He has the intimidation factor, as well as the experience. Rauch prior to this season, Rauch has 26 career saves: 23 with Montreal/Washington and three with Arizona. This season, Rauch has converted all five of his save opportunities, and has a 1.80 ERA. The Twins acquired Rauch from Arizona in 2009 for Kevin Mulvey. Rauch went 5-1 with a 1.72 ERA for the Twins in 2009. In the off-season, ChiSox manager Ozzie Guillen hinted that he wanted to change the White Sox style of play to emulate that of the Twins. The Sox declined to re-sign Jim Thome or 2005 World Series MVP Jermaine Dye, but did sign speedy outfielder Juan Pierre. All three games were decided by one run, including an 11 inning affair in Game Two. Joe Mauer, pinch hitting for Drew Butura, walked to lead off the inning, and was eventually hit home on a JJ Hardy single. Game Three could have gone into extras as well. With Hardy on first and two outs, Jim Thome hit a line drive off the left field fence. As the throw from Pierre was about to hit SS Alexei Ramirez, third base coach Scott Ulger sent Hardy home, who was thrown out by a good thirty feet, ending the game. The Twins outscored the Sox 10-9 in the three games. 3. Who is this Delmon Young? After showing promise at the end of the 2009 season (.347, 4 HR, 18 RBI in September), Delmon Young has continued to play well opening the 2010 season. When the Twins elected to trade Carlos Gomez (.229 BA, .289 OBP) to the Milwaukee Brewers, Young felt like the Twins trusted him to do his job well. Young lost 35 lbs in the off season, and played much of spring training in the minors, trying to get every at bat that he could. Young, a notoriously slow starter, was 2-4 with a home run on Opening Day. He is batting .273 with two home runs and seven RBI in the Twins first eight games. After dropping their first game to the LA Angels 6-3, the Twins rebounded, winning the next three games of the four game series to win their first series in Anaheim since 2002. The Twins outscored the Angels 22-12 in the series. The Twins didn't stop there, winning their next two games against the Chicago White Sox, before the Sox ended the Twins five-game winning streak on Sunday afternoon. Carl Pavano threw the first pitch. Marco Scutaro recorded the first hit. Orlando Hudson recorded the first Twins hit. Michael Cuddyer knocked in the first RBI (his first of the season), Jason Kubel hit the first home run, and Mike Cameron hit the first booth-reviewed home run (foul ball). The Twins beat the Boston Red Sox in their inaugural home opener 5-2.